Slow down there, tiger. This isn't quite the Star-Lord you know and love from the movie. It's not even the same Peter Quill you might be familiar with from the current comics. OOGA CHAK— huh? No whimsical mix of boyish bravado and wounded vulnerability? No hilarious obscene gestures? No self-aware references to '80s pop culture? No Walkman stuffed with upbeat '70s AM rock? No crazy mask that seems to protect him from the vacuum of space even if he's just wearing regular clothes? NO DANCE-OFFS? Nope. A lot of that's been gradually retconned into the character over the years, but you won't find it here. Nor will you find any monosyllabic anthropomorphized trees or wisecracking raccoons, or Thanos, or Gamora, or Drax, or any of the other characters or planets who made it into the big Marvel movie. In fact, it's not likely that these old stories are supposed to be set in the Marvel Universe at all. But Marvel's always had space heroes, right? The Guardians have been around in one form or another since the end of the '60s. Well, sure. And starting in the mid-'70s, Marvel got very interested in space and science fiction (not unlike the great novelty entrepreneur Irwin Mainway). SF was about to become a really big deal in popular culture. Star Trek was a huge phenomenon, The Six Million Dollar Man was a ratings smash, Space: 1999 had just arrived on American screens, big-budget movies like Rollerball, Logan's Run, and The Man Who Fell To Earth were popular with audiences, and there was a little independent film called The Star Wars on the horizon. Science fiction novels were starting to appear regularly on bestseller lists; rock music was suffused with genre imagery and themes. The science fiction iron was hot; if there was any time to strike, it was now. In the regular Marvel titles, this meant space-based superheroes like Warlock, the resurgent Guardians (who appeared in the pages of The Defenders and The Avengers), and the Nova Corps, all of whom would cross paths with Peter Quill in the future. But Star-Lord's origins were in a periodical that wasn't even technically published by Marvel Comics. At the time, the company was experimenting with a series of black-and-white illustrated magazines aimed at "adult" readers in the hopes of expanding their audience to include non-comics fans. Released under the more dignified-sounding "Curtis Communications" imprint, these magazines were exempt from the Comics Code Authority, designed to appeal to fans of non-superhero-related genres, like men's adventure (Savage Tales), horror (Monsters Unleashed) or humor (the MAD knockoff Crazy). There was even a very short-lived underground comics anthology called Comix Book. Their biggest success, however, was Savage Sword of Conan, which, along with the color comic, popularized Robert E. Howard's adventurer with a new generation of fans. If Conan could make "mature" sword and sorcery comics popular with suburban teenagers and their dads, then surely it wouldn't be hard to do the same with science fiction. So, in Marvel Preview #4, dated January 1976, Star-Lord was born. So Star-Lord was a "mature readers" comic? Well, sort of. The original story by Steve Englehart and Steve Gan isn't exactly the kind of thing you'd want a small kid to read — it's pretty violent and dark, and kinda sends the wrong messages to impressionable minds. (There's also some mild profanity to remind you that this wasn't subject to the Code.) After a somewhat rambling introduction that opens with the Ed Wood-worthy "Nobody knows what the Universe is," a brief oration on the role of astrology in human affairs, and a flashback to the birth of Jesus Christ, the action skips ahead a couple of millennia to 1962, and the birth of another child of otherworldly provenance. Peter Jason Quill is the son of a Earth woman living in rural America named Meredith and an alien father, but that's about all the character has in common with the cinematic version. Meredith's abusive boyfriend accuses her of being unfaithful because her newborn son doesn't look like him, but before he can kill Meredith or Peter, he drops dead of a heart attack. Meredith raises Peter, who takes a deep interest in space travel from watching Star Trek and the moon landing. Tragedy strikes when Peter turns 11. Meredith dies, not from cancer, but after being shot by lizard people from a passing flying saucer, and Peter ends up in a brutal orphanage. It's like Chariots of the Gods as rewritten by Dickens. My hero would go from being an unpleasant, introverted jerk to the most cosmic being in the universe, and I would tie it into my then-new interest in astrology. After his earthbound beginning, his mind would be opened step by step, with a fast-action story on Mercury, a love story on Venus, a war story on Mars, and so on out to the edge of the solar system, and then beyond. But - after his earthbound beginning, where I established him as an unpleasant, introverted jerk, I left Marvel, so no one ever saw what he was to become. The guys who followed me were clear that they couldn't follow through on the astrology, so they settled for smoothing off his rough edges - a very useful approach as time has shown. The guy chosen to sand off Quill's rough edges was a rising star himself, a young, relatively unknown writer named Chris Claremont, who was only just beginning to establish his reputation on Uncanny X-Men. Marvel's choice couldn't have been better. A fan of classic SF literature, Claremont abandoned Englehart's messianic storyline, and sought to remold the saga closer to the space operas of his youth, such as the juveniles of Robert Heinlein and Andre Norton, with echoes of Poul Anderson's Polesotechnic League and Larry Niven's Known Space. For the first edition of the magazine, Marvel played up the connection with a cover blurb stating that the story was "in the tradition of Robert A. Heinlein"; unamused, Heinlein had his lawyers contact Marvel, requesting the offending text be removed from future printings. Marvel conceded without a fight. But it's hard to miss the parallels with Heinlein's juveniles, particularly Citizen of the Galaxy. For his inaugural story, a "novel-length" adventure published in Marvel Preview #11, Claremont pushed Quill to the sidelines, downplaying his origin story and moving the action to the far side of the galaxy. Initially, the protagonists were a pair of plucky teenaged humans, telepathic Kip and gamine Sandy, abducted from their home planets by ravenous interstellar slavers. (For his stories, Claremont seems to have moved the story not only in space but forward in time, as it's implied that Kip's ancestors were Scandinavian colonists.) In their attempts to escape the slavers' massive battleship, the teens come across the laconic, aloof Star-Lord, seeking both his mother's killers and his father's identity. After an initial period of mistrust, the three join forces, setting off on an action-packed, galaxy-spanning quest that leads to wild adventure on exotic worlds and palace intrigue in the halls of interstellar governance. Star-Lord avenges his mom, meets his dad, Kip and Sandy fall in love, and it all ends pretty well for everyone involved. It ended really well for the creative team on that particular story. Claremont's collaborators were a pair of relatively unknown illustrators named John Byrne and Terry Austin, who would soon assume the art chores on Uncanny X-Men. Their three-year, 35 issue run on the series, which included the Dark Phoenix Saga and Days of Future Past storylines, would catapult it into stratospheric levels of popularity. By the 1980s, Claremont and Byrne would be comics superstars. And Claremont would recycle a lot of the material from his Star-Lord story in X-Men: Kip and Sandy are clearly prototypes for his sympathetic teenaged mutants, like Kitty Pryde (Quill's current squeeze), and a lot of the intergalactic political intrigue and swashbuckling would turn up in the series' '80s space opera epics involving the Shi'ar and other spacefaring empires. Star-Lord's relationship with his dad also prefigures Scott Summers' somewhat fractious reunion with his father Corsair. Sandy, like the X-Men's Storm, is a former street urchin and thief. "Ship" has a habit of dying and being reborn like Phoenix — in fact, she used to be a billion-year-old star with life-bearing worlds of her own before warring aliens forced her to go nova, destroying her planetary system in the process. But science fiction was huge in the early '80s! Why didn't Marvel try to revive the character? Probably because by that point, Marvel had licensed comics based on most of the big genre movies and TV shows of the period, like Star Wars, Star Trek, and Battlestar Galactica, and didn't need its homegrown space heroes. SF toy licenses, such as Micronauts and ROM, were also hugely popular. (And at this point, the Transformers weren't even a twinkle in Hasbro's eye.) Nova faded into obscurity, along with the Guardians, and the "cosmic" heroes like Howard the Duck, Captain Marvel, and Warlock died or faded into the background as their creators moved on to new works in greener pastures. Still, it's hard to keep a seasoned space adventurer down, and Marvel tried once more to revive the character with a limited series from 1997-98. This time, the hero is one Sinjin Quarrel, a young telepath in a far-flung galactic society who discovers "Ship" in a forest and assumes the long-vanished, de-hyphenated Starlord's identity and mission. If "Sinjin Quarrel" sounds like a character from the Star Wars Expanded Universe, that's no coincidence; the writer is Timothy Zahn, the Hugo Award-winning SF writer and the author of Heir to the Empire, among many other EU books. The painted artwork, by Dan Lawlis, has a vaguely European quality that suits the spacey tone. 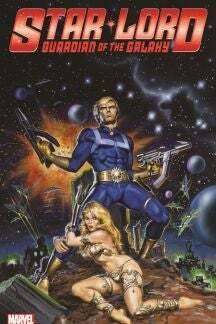 Marvel would revive Star-Lord in the 2000s, hyphen and all, eventually giving him a streamlined origin that incorporated elements of Englehart and Claremont's material and placed him firmly within the Marvel Universe — Meredith's killers were retconned as Badoon, the warlike race introduced in the first Guardians of the Galaxy story back in 1969. But it's pretty clear that the Star-Lord in these older stories is not the Peter Quill in the current Marvel comics, let alone the hugely popular movie. So what's the point of reading these stories, then? Because, well, they're fun! Most of them are, at least. The Englehart origin story is utterly batshit crazy, in the way that a lot of mainstream comics were back in the '70s, but it's no less interesting for that. The Claremont stories are solid pastiches of classic SF tropes, and suggest an alternate direction his career could have taken if he hadn't discovered mutants. The Moench stuff is a bit more pedestrian, and the Zahn material is... interesting. On the whole, it's a mixed bag, but it's a fascinating object lesson in how a little-known character can endure, evolve, and revive over time, as opposed to falling into well-established familiar patterns. Along with Spider-Woman, Moon Knight, Luke Cage, Danny Rand, and Carol Danvers, Star-Lord is one of those wild 'n' crazy Bronze Age underdogs who just won't stay out of action for very long. The stories in this book can be uneven in places, but they demonstrate why creators keep bringing him back.